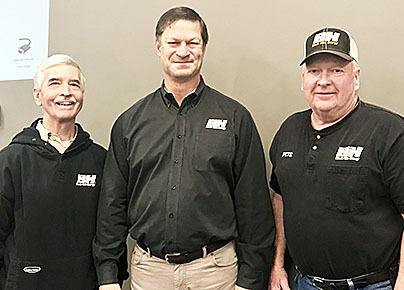 RETIREMENTS PLANNED — Lonnie Smith (left) pictured here with David Emery, Black Hills Corporation CEO and Pete Sallach (right). Smith and Sallach were congratulated on their retirement during a recent employee meeting in Albion. Together, they have served 77 years in their positions. Pete Sallach has worked 44 years for the local gas company in Albion, now Black Hills Energy. Pete will be retiring at the end of January. 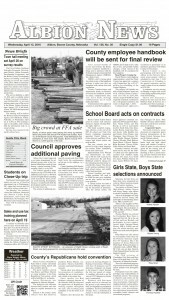 He was hired on April 8, 1974 as part of the maintenance crew with Kansas-Nebraska Natural Gas Co. Currently, Pete is responsible for keeping the gas system safe and reliable as a corrosion technician with Black Hills Energy. Joining Pete in retirement is Lonnie Smith, a service technician with the company who began his career on June 17, 1985. For nearly 33 years, Lonnie has kept local residents’ homes warm and appliances running with his work as a service technician. Not only are they serving their community’s energy needs, they’re also both involved in community organizations. Pete is a local youth mentor with the Pheasants Forever program. Lonnie is also active with that program, and he is a member of the Knights of Columbus.